I was taken aback by the two figures selected by scriptwriter Bernd Eichinger for "good guy" treatment in the script. 5:45 PM TAXI to Soho Square to the studios of Twentieth Century Fox, for a private viewing of Downfall, Der Untergang -- the new German film of Hitler's last days. Lady Michele accompanies me. The movie theatre is packed, and I notice four staff members from Wiener Library have signed in ahead of me in the guest book. I wonder what they make of the film. I know what C C Aronsfeld would have thought! I must say that after all the hoopla in the German media, I am disappointed. From the opening title of Constantin Film Verleih, worse than the clumsiest that Ufa could produce, to the closing sequence -- pictures of the actors, with where-are-they-now biographies of the real characters, the film was unbelievably clunky and amateurish in parts. The German producers did not stoop to Steven Spielberg's trick of making it in black and white ("to provide documentary footage for the future", as the chief camera director of Schindler's List disingenuously told his trade journal Der Kameramann); the colour in Downfall is washed-out, low key, Berlin-grim. The actors are sometimes easy to identify -- for us Nazi experts anyway -- by the uniform they are wearing, and sometimes not; Dr Joseph Goebbels is far too big to be the Little Doctor, but he is evidently chosen for his ability to mimic the propaganda minister's superb Rhineland elocution, and at times he does so with chilling verisimilitude. A corpulent army general is identified to us only in the closing titles as having been Alfred Jodl, hanged at Nuremberg; we would never have guessed -- the real Jodl was a wiry, balding, and spare-framed mountain-artillery officer. Martin Bormann, the same: fat, perspiring, unhealthy in the film, in reality burly, muscular, slicked haired, and scowling. Otto Günsche, Hitler's long-time SS adjutant, we would never have recognized from the tall handsome dark-haired officer in the film; the real Günsche, who provided to me in the 1960s the first hand narrative on how Hitler and Eva Braun took their own lives, and the dialogue between them which mysteriously turns up verbatim in this film script, was burly, Aryan, and blonde. In the film Walther Hewel, Ribbentrop's liaison officer to Hitler, is a thin, nervous, weedy, pharmacy-clerk type of man; in reality (see my picture from his files: he is at far right, with Heydrich, centre, and Julius Schaub) he was a broad shouldered, suave, dark-haired diplomat, a handsome lady's man -- the only top Nazi to have seen the outside world, having spent twelve years of his life as a rubber planter in Java. HAVING said that, I can say what saves this film and elevates it into a stellar category are the spectacular and deeply human portrayal by Bruno Ganz (below) of the aging and defeated Adolf Hitler -- he has perfected the guttural Austrian accent down to the last rolling rrrrr; and the warm, affectionate portrayal of his secretary from 1942 to the end, Traudl Junge. She is played by a Transylvanian-born actress of great feminity and beauty, with moist, limpid eyes that are able eloquently to convey her feelings, for example the delicate disgust when Goebbels dictates his final will, emphasizing the purity and unblemished (makellos) character of his actions, before turning away to mastermind the murder of his six children. This is the one scene which does bring a tear to my eyes, I confess, even though the script falsely has Dr Ludwig Stumpfegger administering a sleeping draught to the reluctant infants, whereas they were in fact anesthetized with a morphine injection by the SS dentist in the bunker; when they were sound asleep their mother Magda crushed a glass a cyanide ampoule in each tiny mouth using a pair of pliers. Magda here is a departure from reality; she is played as a cunning, fiendish, Machiavellian, raven-haired and slender female displaying all the warmth and maternal charm of the evil "Mrs Danvers" in Alfred Hitchcock's Rebecca; I do know real women who are like that, but in reality Magda Goebbels (right, with her two oldest daughters) was a simple, charming, feminine woman, once platinum-blonde, whose comeliness as a female was a not lessened by having borne six children. 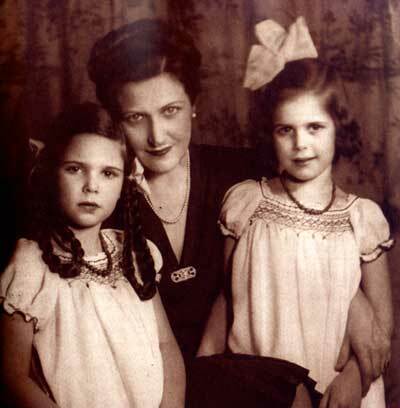 She had once dated Chaim Arlosoroff, a Zionist fanatic later assassinated in Palestine, and her step father (and I believe real father) Robert Friedländer was Jewish (and met his end like many other Jews as a dehumanized prisoner in the concentration camp at Buchenwald). I WAS taken aback by the two figures selected by scriptwriter Bernd Eichinger for "good guy" treatment in the script. One is Professor Dr Dr Ernst-Günther Schenck; I interviewed him many times in the 1970s and obtained from him the graphic descriptions and dialogues of the last two days in the bunker -- which now strangely turn up, unchanged, in this film's script. Note that in the German façon, having won two doctorates, he sported both Dr's in his title. 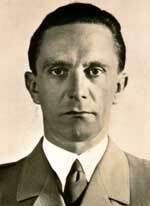 He headed an SS branch on nutritional medicine, and there are the inevitable allegations against him as an SS doctor. In this film however Schenck is an unquestioned moralising hero, as is a far darker figure, Hermann Fegelein. The real Hermann Fegelein was a murderous, womanizing, power-hungry SS cavalry officer -- I interviewed his brother Waldemar once -- who married Eva Braun's slightly sluttish sister Gretl, and was shot for desertion in the last days of the war. Eva incidentally was about ten years younger than the actress in this film. He was found in his apartment in Berlin, in civilian clothes, planning to flee, with a belt of gold coins to facilitate his flight; as well he might, for an Allied gallows would certainly have awaited this officer, whose 1st SS Cavalry Division of horseback huntsmen conducted a ruthless war against Partisans and their accomplices -- and we historians all know what that means -- in the occupied eastern territories. second, Otto Günsche told me that it was he personally who had gone to Hitler and advised him that he and the other adjutants, hearing that the Chief was minded to show clemency, were demanding that Fegelein be stood before a firing squad for his cowardice. There are loose ends left unexplained in the film. General Hans Krebs is shown at the end, negotiating with Marshal Zhukov's officers and speaking fluent Russian; left as it is, it gives the impression that he may have been a Soviet traitor in Hitler's headquarters. In fact he spoke fluent Russian having been military attaché in Moscow until Barbarossa began in June 1941. We are not told why the secretary Traudl Humps' name changes in mid-film to Traudl Junge. She had married Hitler's Ordonnanz, SS Hauptsturmführer Wolf Junge, but the wartime marriage did not last long. She described to me how in June 1944 "the Chief" (wrongly translated as Führer, several times, in the sub-titles) had sent for her, tears in his eyes, taken both her hands in his, and said, "Ach, mein Kind, I am so sorry" -- and broken to her the news that Wolf had just been killed in action in the Normandy fighting. ALTHOUGH the "consultant" credited in the titles is a certain Joachim Fest, well-known German TV presenter and personality and author, I suspect that my own name might by rights have been there in the titles too. As my readers will recognize immediately, at least fifty percent of the dialogue has been lifted straight out of my book Hitler's War (first published in Germany in 1975), and much of the rest from my Joseph Goebbels biography too! There is nothing new or even unusual about this. Fest is not an author well known for original research but, as they say, using just one book is plagiarism; using two is investigation; while using three or more is deep, profound, original, and overwhelming in-depth research. Several times, as a scene was set up in this film, I found that I knew precisely what was going to come next; once, the screen fills with Hitler handing out cyanide capsules to his staff, standing dutifully in line as though at a Christmas reception, and he reaches Traudl. I turn to Lady M, and recite: "I am so sorry that I can offer you nothing better than this." And there is that very line on the screen. I am sorry too -- sorry to see that the film makers have done to Traudl what they did to Lida Baarova (Goebbels' girlfriend, right) in her Westdeutscher Rundfunk television interview about him: they required the latter female to come back on screen and gently grovel (but Lida cleverly changes her dress for this final shot, so that future cognoscenti can recognize what has happened). So here too, after the Hitler film ends, it produces the real Traudl Junge, now in her late 80s, wrinkled and with her once-fair complexion pocked and blemished by the imminent onset of death, and she apologises for not having seen how wicked her Chief, Adolf Hitler, really was. At one point in this toe-curling postscript her memorized lines make her say that she has recently realized, walking past the memorial tablet for Sophie Scholl -- one of the student traitors in Munich -- that Sophie was the same age as she, and had been executed on the same day that she was being interviewed by Hitler for her job as a secretary. But that cannot have been so, because her job interview was in November 1942, as the film also makes plain at the beginning; and the Scholl sisters were executed in 1943 -- in March, if memory serves. But even here something of the real Traudl tweaks through. She says that had she known what was going on . . . to the Jews . . . then, of course . . . but she never heard even a murmur of that while working next to Hitler. At Hitler's headquarters! At Hitler's side: present at his conference table, and at his table talks: throughout the remaining months of the war, from Stalingrad onwards, literally to the very end: never heard a murmur about what since the 1970s is called The Holocaust. Now what can that portend? That is a real conundrum, which may or may not sink in with the movie-goers. All of Hitler's staff, including his surviving verbatim conference stenographers, confirmed this to me -- that nothing was ever said or known about it at Hitler's HQ -- as did Richard Schulze, his personal SS adjutant, when I invited him to attend a live David Frost TV program devoted to my Hitler biography on June 9, 1977); just as Hitler's personal staff had all told the American and British interrogators shortly after the war, at a time when to say otherwise would certainly have earned them favours, like a transfer from the criminal wing to the privileged witness wing at Nuremberg. Kurzum: Not a word of the atrocities filtered back into Hitler's "monastery-like" headquarters. Hitler ten days before the end handing out Iron Crosses to schoolboy-age Hitler Youths for heroism against the Soviet tanks. Hitler emerging briefly from the ruined bunker to the garden, surrounded by his staff (a photograph actually taken after a British air raid in November 1943, according to Julius Schaub, not in April 1945). There are some minor flaws. History shows that Hitler orders the thirty or so nurses brought in to his bunker from the next-door Voss Street bunker, which has been turned into an emergency hospital, to decorate and commend them for their courage in tending the injured. Schenck described the scene to me -- and here it is, like magic, in Bernd Eichinger's film -- but there is only one nurse here, the one who sinks in hysterics to the ground and clutches Hitler's knees and implores him to leave Berlin. Economising on extras? Another tiny flaw: I would swear that the exit staircase from the bunker was a Wendeltreppe, a spiral staircase, not the square concrete staircase shown in the film. Otto Günsche told me how awkward he had found it to carry the cyanide-reeking body of Eva Braun up the spiral to the garden. But Winston Ramsay, editor-in-chief of After the Battle, has also attended the screening, and he has actually visited the ruins, and he tells me over a modest supper in Soho afterwards that he thinks that "square" is right, not spiral. UNIMPORTANT? But there are also major excesses and distortions. The bacchanalian scenes and orgies -- routine in such narratives now -- are fiction. Not a cigarette was lit in the Bunker until Hitler was dead. The drinking did begun, but it was necessarily discreet. I cannot credit at all one final scene, showing General Helmut Weidling, the city's Kampfkommandant, driving round Berlin in a loudspeaker van roaring that Hitler has committed suicide and betrayed his men. On the contrary, Grand Admiral Karl Dönitz and the German people were told that "the Führer has fallen in action, defending the Reich capital." The corresponding radio announcement on May 1, 1945 was actually made by the late Jochen Piechocki, Vertreter der SS im RmfVuP, later better known as Jochen von Lang, my friend the capable Stern researcher who discovered the remains of Martin Bormann and Dr Stumpfegger beneath a Berlin street in the 1970s: "Our Führer, Adolf Hitler, has fallen in battle while fighting to the last breath [bis zum letzen Atemzug]." What is remarkable is that the Adolf Hitler masterfully portrayed in this film is allowed on three or four occasions to deliver compelling National Socialist propaganda speeches to his audience which, I estimate, will not be without effect on ordinary Germans (to borrow Professor Christopher Browning's eloquent phrase). The real National Socialism was not what it had become by 1945. It was something else, purer, infinitely less criminal, and infinitely more idealistic. Hitler's personal adjutant Alwin-Broder Albrecht wrote this in his last letter (his widow showed it to me), before storming out of the Chancellery building after the Chief's death with a blazing sub-machine gun in his hands, and going down in a hail of Russian bullets. Hitler too makes plain his regrets about this deviation from his original National Socialist ideal, in brief monologues in the film. So my verdict on the film is this: Must Try Harder. 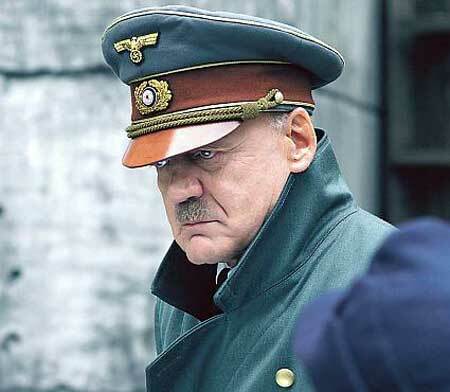 Downfall is a good attempt, and great entertainment if you like that sort of thing; not a tear-jerker (like Hitler's War, according to my friend David Kahn) but an innovational film. It has brilliant, indeed intimidating, all-around sound effects of the Battle for Berlin, and wonderful and accurate portrayals of both Hitler and his secretary Traudl Junge; but a jerky, wooden script, which takes liberties with history and the real characters. There are too many helpings of p.c. and of undiluted Schlock; too much Hitlerjunge Quex (the prewar non-Goebbels movie, in which the grand music of the Horst Wessel Lied swells from the screen as the film's young hero, mercilessly beaten by communists, dies giving the Hitler salute). Stephen Spielberg would have done it better. Dinner, as said, with Winston Ramsey. He knows the exact spot where Heinrich Himmler's body is interred on the Lüneburg Heath, and revisited it some years back with the two War Office people who originally buried it; but he has refused to reveal it to anybody and I do not press him. He also has Himmler's suitcase, and he knows who has his eye glasses. All Himmler's personal property, he says, was divided up among the British troops as souvenirs at the time of his arrest. I ask who has his 1945 Taschenkalender (pocket diary) -- Ramsey does not know. M. has spent the afternoon with four rabbis, interviewing them about Palestine, and constantly wants to talk about this event; I find the Jews tedious and boring, and successfully silence her. Back home at 10:50 pm. The apartment is in silence, as they are both asleep.